The major histocompatibility complex (MHC), including human leukocyte antigen (HLA) genes, is located in chromosome 6p21. It contains crucial genes for crucial immune responses and other genes with nonimmunological roles . The HLA genetic system, located in the MHC Class I and Class II regions, displays the highest degree of polymorphism of any functional genetic complex with medical impact representing a landmark for the development of preventive and predictive medicine. The high level of diversity involving HLA alleles reflects the essential roles of the encoded molecules in human health and disease . New HLA alleles continue to be discovered and the recognition of HLA low-incidence alleles has enriched our understanding of the complexity of the HLA system. The HLA genes are characterized by their extreme allelic polymorphism as well as their variations and diversity in different ethnic groups and racial populations . HLA molecules have been definitely defined as transplant antigens and have a strong relevance to tissue transplantation. Their molecule similarity in donors and recipients is being considered a predictive factor for graft survival and graft versus host disease . It is imperative to precisely characterize any unknown and low-incidence alleles encountered during routine HLA typing procedures. To facilitate successful, comprehensive unrelated bone marrow hematopoietic stem cell donor searches for patients in need of hematopoietic stem cell transplantation, persistent effort is required to resolve unidentified, ambiguous, and low-incidence alleles to offer better HLA matching and donor selection . HLA-C*15:29, a rare frequency allele , was officially submitted to IPD-IMGT/HLA Database in October 1992 . The allele was found in an Oriental individual with Thai ethnicity without information on its associated HLA haplotype . The frequency of C*15:29 was estimated as 0.0018% in 169,995 volunteers donors studied in the China Bone Marrow Donor Registry Program  while a 0.001% frequency of C*15:29 was reported in 519 England blood donors of mixed ethnicity tested . In this report, we confirm the Oriental ethnicity of C*15:29 and identify the deduced plausible HLA haplotype in association with C*15:29 based on HLA typing of the Taiwanese individuals we observed in our routine HLA typing practice. A total of 12,534 unrelated healthy Taiwanese individuals were tested for C*15:29 in this study. Peripheral whole blood samples from individuals with Taiwanese ethnicity were collected in acid citrate dextrose (ACD) anticoagulant. Formal written consent was signed by the individuals before blood collection. The ACD whole blood samples were stored at −80°C until use. Genomic DNA was extracted using the QIAamp DNA Blood Mini Kit according to the manufacturer's instructions (Qiagen, Hilden, Germany). Genomic DNA from the unrelated individuals was subjected to HLA genotyping for HLA-A, -B, -C, -DRB1, and -DQB1 loci using commercial PCR-SBT kits (TBG, Medigen Biotechnology, Taipei, Taiwan). Polymerase chain reaction was performed to amplify exons 2, 3, and 4 of the HLA-A and HLA-B loci; exons 1, 2, 3, 4, 5, and 6 of the HLA-C locus; and exon 2 of the HLA-DRB1 and HLA-DRQ1 loci using group-specific primer sets. The amplicons were sequenced in both directions with the BigDye Terminator Cycle Sequencing Ready Reaction Kit according to the manufacturer's (TBG, Medigen Biotechnology, Taipei, Taiwan) protocols. Determination of HLA allele-associated probable haplotype employed in this study is by looking at the commonly shared HLA typing of the donors carrying C*15:29. This study was conducted in accordance with the Declaration of Helsinki and was approved by the ethics committee of the Hualien Tzu Chi Hospital (IRB106-81-A). In a total of 12,534 randomized healthy Taiwanese individuals tested, eight individuals with C*15:29 were identified which makes the frequency of C*15:29 in the Taiwanese population approximately 0.064%. We confirmed the DNA sequence of HLA-C*15:29 is identical to C*15:02:01:01 in exons 1, 2, 3, 4, 5, and 6, except for residue 420 (codon 116) at exon 3 and residue 1034 (codon 321) at exon 6. In residues 420 and 1034, A and G of C*15:02:01:01 are substituted by C and A in C*15:29, respectively [Figure 1]a. The nucleotide substitutions introduce two amino acid replacements at residue 116 and residue 321 where leucine (L) and cysteine (C) of C*15:02:01:01 are replaced by phenylalanine (F) and tyrosine (Y) in C*15:29, respectively [Figure 1]b. The extended HLA typing of the unrelated Taiwanese individuals with HLA-C*15:29 is shown in [Table 1]. Based on the commonly shared HLA-A, -B, -C, and -DRB1 alleles of the individuals [Table 1] and together with the HLA typing of the two donors submitted to the IPD-IMGT/HLA Database (A*24:10:01, A*29:01:01:01, B*07:05:01, B*51:01:01:01, C*07:04:01, C*15:29, DRB1*04:05:01, DRB1*10:01:01, DQB1*04:01:01, and DQB1*05:01:01; and A*24:10:01, A*29:01:01:01, B*07:05:01, B*51:01:01:01, C*07:04:01, C*15:29, DRB1*04:05:01, DRB1*10:01:01, DQB1*04:01:01, and DQB1*05:01:01) , we deduced the most probable HLA-A-B-C-DRB1 haplotype in association with C*15:29 in Taiwanese to be A*29:01-B*07:05-C*15:29-DRB1*10:01. When HLA-DQB1 typing of the donors is taking into account, the most probable HLA-A-B-C-DRB1-DQB1 haplotype associated with C*15:29 may be deduced as A*29:01-B*07:05-C*15:29-DRB1*10:01-DQB1*05:01. We confirmed the DNA sequence and amino acid sequence of the low-frequency HLA allele C*15:29 in this study. C*15:29 was initially discovered in a Thai individual without knowledge of the probable HLA haplotype in association with the allele . In this study, we ascertain the Oriental ethnicity of C*15:29 and propose the deduced probable C*15:29-associated HLA-A-B-C-DRB1-DQB1 haplotype to be A*29:01-B*07:05-C*15:29-DRB1*10:01-DQB1*05:01. This finding is in agreement with the C*15:29-associated HLA-A-B-C haplotype indicated on the Allele Frequency Net Database (www.allelefrequencies net/hla6006a.asp). Information on the ethnicity of C*15:29 and its linked HLA haplotype can be employed in anthropological investigation of races. In addition, bone marrow donor registries can allocate appropriate unrelated stem cell donors for patients with C*15:29. In addition, knowing the nucleotide and amino acid variation between C*15:29 and the prevalently observed C*15:02:01:01 allele may be helpful when selecting a minor HLA-mismatched unrelated bone marrow stem cell donor for a patient with the rare C*15:29 allele. It is worth mentioning that the most direct and classic method of determining HLA haplotypes is through a family study if test materials from a number of key family members are available. Alternatively, a population study may be employed if a sufficient number of unrelated donors are available . However, the haplotypes deduced via population investigation are considered to be likely or most probable ,,,,,,,. In this study, because of the lack of availability of necessary test material from the families, we opted to determine the haplotypes by looking at the HLA alleles carried in common by randomized unrelated donors with the same alleles of interest. By the same token, if determination of plausible HLA-associated haplotypes is for rare or low-frequency HLA alleles, the alleles shared in common by unrelated individuals may be employed to deduce the associated probable haplotypes ,,,,,,,. The frequency of C*15:29 in Taiwanese is about 0.064%. Therefore, we think the deduced probable C*15:29-associated HLA haplotype in Taiwanese that we deduced in this study are accurate. Nevertheless, we cannot rule out the possibility that additional C*15:29-associated HLA haplotypes may be revealed in the future when increased number of individuals with C*15:29 is detected. The number of known HLA alleles is increasing with the recent development of DNA-based molecular typing technology. There is a high level of HLA diversity among ethnic groups and knowledge of this diversity is important. Matching of bone marrow stem cell donors relies on the accuracy of HLA typing results. This is dependent on the resolution of unknown, ambiguous, and low-incidence genes in the HLA system. We are indebted to all volunteer donors who joined the Buddhist Tzu Chi Bone Marrow Donor Registry and gave consent for our research project. Their unselfishness and efforts to help needy patients are most appreciated and respected. We would like to give sincere gratitude to Dharma Master Cheng Yen, Founder of the Buddhist Compassion Relief Tzu Chi Foundation, for continuing support and kind encouragement, both spiritually and intellectually. Furthermore, we thank our colleagues at the Tzu Chi Immunogenetics Laboratory, Tzu Chi Stem Cells Centre, for technical assistance. Their generosity and camaraderie are truly appreciated. Steele EJ. Reflections on ancestral haplotypes: Medical genomics, evolution, and human individuality. Perspect Biol Med 2014;57:179-97. Charron D. HLA, immunogenetics, pharmacogenetics and personalized medicine. Vox Sang 2011;100:163-6. Robinson J, Mistry K, McWilliam H, Lopez R, Parham P, Marsh SG, et al. The IMGT/HLA database. Nucleic Acids Res 2011;39:D1171-6. Petersdorf EW, Malkki M, Gooley TA, Martin PJ, Guo Z. MHC haplotype matching for unrelated hematopoietic cell transplantation. PLoS Med 2007;4:e8. Davey S, Ord J, Navarrete C, Brown C. HLA-A, -B and -C allele and haplotype frequencies defined by next generation sequencing in a population of 519 English blood donors. Hum Immunol 2017;78:397-8. Robinson J, Halliwell JA, Hayhurst JD, Flicek P, Parham P, Marsh SG, et al. The IPD and IMGT/HLA database: Allele variant databases. Nucleic Acids Res 2015;43:D423-31. Zhou XY, Zhu FM, Li JP, Mao W, Zhang DM, Liu ML, et al. High-resolution analyses of human leukocyte antigens allele and haplotype frequencies based on 169,995 volunteers from the China bone marrow donor registry program. PLoS One 2015;10:e0139485. Yang KL, Chen SP, Shyr MH, Lin PY. High-resolution human leukocyte antigen (HLA) haplotypes and linkage disequilibrium of HLA-B and -C and HLA-DRB1 and -DQB1 alleles in a Taiwanese population. Hum Immunol 2009;70:269-76. Yang KL, Lee SK, Lin CC, Jiang S, Chiu HM, Lin S, et al. Oriental HLA-A*11:90 detected in a Taiwanese cord blood sample and the haplotype in association with A*11:90 allele. Int J Immunogenet 2011;38:543-6. Yang KL, Lee SK, Kao RH, Lin CL, Lin PY. Discovery of the novel HLA-DRB1*03:77 allele in a Taiwanese unrelated hematopoietic stem cell donor by a sequence-based typing method and identification of the probable HLA haplotype in association with DRB1*03:77. Int J Immunogenet 2012;39:442-4. Yang KL, Lee SK, Kao RH, Lin CL, Lin PY. Discovery of the novel HLA-DRB1*16:16 allele in a Taiwanese unrelated bone marrow stem cell donor by a sequence-based typing method and the probable haplotype associated with DRB1*16:16. Int J Immunogenet 2012;39:445-7. Yang KL, Lee SK, Kao RH, Lin PY. Discovery of the novel HLA-DRB1*10:04 allele in a Taiwanese volunteer bone marrow donor and identification of the probable HLA-A, -B, -C and -DRB1 haplotype in association with DRB1*10:04. Int J Immunogenet 2012;39:448-50. Yang KL, Lee SK, Lin PY. Discovery of a novel HLA-B*51 variant, B*51:112, in a Taiwanese bone marrow donor and identification of the plausible HLA haplotype in association with B*51:112. 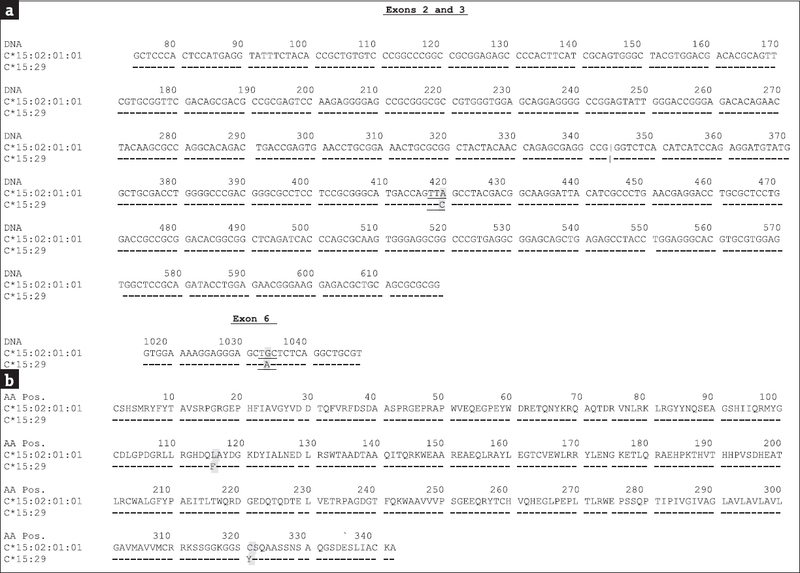 Int J Immunogenet 2012;39:451-3. Yang KL, Lee SK, Lin PY. Identification of the novel HLA allele, HLA-B*40:159, in a Taiwanese hematopoietic stem cell donor and the probable HLA haplotype in an association with B*40:159. Int J Immunogenet 2012;39:520-3. Yang KL, Lee SK, Kao RH, Lin CL, Lin PY. Recognition of HLA-A*24:137 allele in a Taiwanese unrelated bone marrow stem cell donor and the plausible HLA haplotype associated with A*24:137. Int J Immunogenet 2012;39:530-1. Yang KL, Lin PY. Two conserved HLA haplotypes (HLA-A*11:127N-B*54:01-DRB1*04:05 and HLA-A*11:01-B*40:221-C*03:04-DRB1*14:54-DQB1*05:02) observed in the Taiwan population. Tzu Chi Med J 2013;25:218-20.